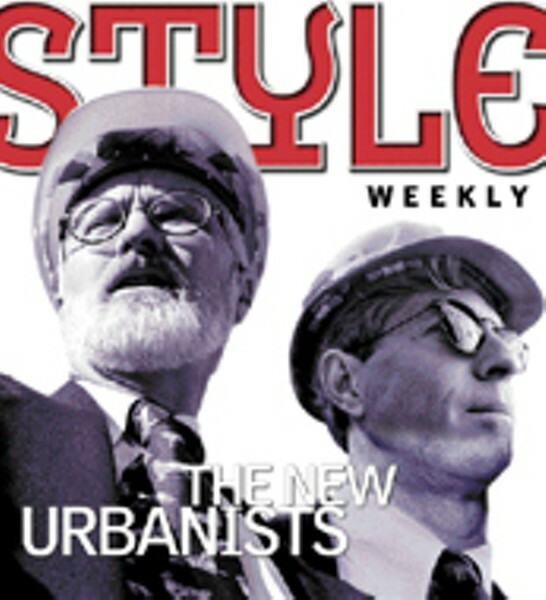 The New Urbanists | Cover Story | Style Weekly - Richmond, VA local news, arts, and events. Harnsberger anticipates the splendor as he scales the 120-foot scaffold to reach the top. He steps to the center of a platform, gazes south across the snaking James River, and scans the city to the east and west. It must be a powerful view for an architect. He pauses for one long reflective moment, and asks, "Isn't this incredible?" A few feet away, a construction worker stoops to handle some stone. It seems to remind Harnsberger of the work to be done. Along the descent he points out dull and fractured brownstone trim awaiting replacement by ready-stocked, better-hewn stone from Germany, and lonely parapets whose decorative tops soon will arrive from India. The 19-century Gothic revival-style church on Fifth Street between Franklin and Main is being saved, or at the very least, restored. It's up to Harnsberger to complete the work proficiently. To do so he must fulfill the urban church's structural and ornamental needs, which means he must be mindful of its past and build on what already exists. It's a conflicting responsibility. But the mission of the architect  the designer called upon to impose art on space  is to get it right. The work of the architect spans continents and millenniums, and in Richmond, this role is important. There are 2,500 historically or architecturally important but ailing buildings in the city. And investors and developers have sunk nearly $3 billion into new and rehabilitative projects. What will Richmond's future look like? How will it feel? Will its architecture produce solutions that make it a more welcoming place? They are questions that Harnsberger and his business partner Robert Mills debate. The two merged their professional ideology and experience to become Commonwealth Architects in January 1999, and have watched their business take off. The company's name crops up everywhere. It appears on dozens of building projects recently completed or underway. The former Miller & Rhoads, Stuart Circle Hospital, the Superior Building, Cary Court Park and Shop, Virginia House, Monumental Church, Linden Tower, Shockoe Place, the former Richmond Memorial Hospital, Hanover Tavern, Richmond Cold Storage and the new $79-million Anthem/Trigon data center on Staples Mill Road. Mills and Harnsberger want to restore the fabric of Richmond's historic streetscape and skyline. Their goal, they say, is to convince others that a mutually radical and historic Richmond can happen  and to show how. "These are going to be such hot apartments. I'm amazed the developer wants to do something this cool," says Robert Mills. "You don't get that opportunity very often." He sports a coat and tie, wears a yellow hard hat and motions with his arms to emphasize the scope of the project. To most the site will remain Stuart Circle Hospital, a building designed by renowned architect Charles Robinson. But Mills can see the place as Stuart Circle Complex, a 122,000-square-foot development with office space and 34 high-end apartments, boasting indoor gardens, a fountain, a rooftop terrace, a 260-car parking deck and an incomparable view of Monument Avenue. The cost to convert it is $7.5 million. But for now, it feels like an empty aged hospital under siege. The windows have been blown out. New ones will go in. Within sturdy brick walls the skeletons of dwellings take shape. Construction workers pound and saw. "What we're standing in now is one unit," says Mills, pretending to mark off a large corner section of the first floor. "This is a huge bathroom here," he explains, waving his hands over space he seems to envision completed. Touring the building this way, it's easy to understand how history must take up a place, seeping invincibly into its walls. "See that transom," Mills says, pointing to a newly uncovered entrance. "It shows the ghosting of what had been." Important discoveries have been made, Mills says. At the core of the building is a kind of atrium that envelops a huge smokestack. As a maintenance area for the hospital it had been enclosed with a roof. Recently, it was pried loose. Mills and the building contractors weren't sure what would happen once it was gone. "When we pulled this roof off," he says, "all of a sudden, it made us realize these apartments work with this light." The openness creates an abundance of sunlight that will allow units to have windows that face an interior courtyard. "It was one of those moments of great discovery," Mills says. "It's like an archaeological dig." Mills is eager to show where the rooftop terrace will be. Outside, high above the trees, there's a gravelly concourse now. By next summer people may be sunbathing on patio furniture or gazing at and waving to neighbors below. Imagining it as Mills does, the reincarnation of the hospital seems almost predestined. "Some people thought this was a white elephant, impossible to turn into something exciting," Mills says. "But it's like peeling back the layers of history, like a time machine." But both were called to architecture as young boys. As an 8-year-old, Harnsberger watched the Marin County Civic Center being built and marveled how it seemed to "nestle" into the earth. Mills, when he was about the same age, took a field trip from Hampton to Richmond and learned that a famous architect shared his name  Robert Mills, one of the earliest American-schooled architects who designed the Washington Monument and the Brockenbrough House in Richmond. Today, the two share an enthusiasm for a predecessor's paradigm. In the early 20th century, when new material or methods of construction had been ignored or rejected as unorthodox, American architect Frank Lloyd Wright pioneered the idea of harmonizing a building with its surroundings. It is the guiding principle, say Harnsberger and Mills, that can lead to a better Richmond  a Richmond in which the urban environment is revitalized and built upon. "We've lost this idea of being able to walk down the street," Mills says. "Part of the charm of Shockoe Slip, the reason people want to come back, is because they can walk a couple of blocks and go somewhere." "If you boil down the new urbanists' philosophy," Harnsberger says, "it's about putting the person in the city back in the middle of the design problem. Making it comfortable for one person to live and to have a complete life." But ideas alone don't build buildings. You have to find money. To do that, Commonwealth Architects has embraced tactics that other architectural firms have either looked past or only recently adopted. In 1997, the Virginia General Assembly approved a tax-relief initiative to help restore and preserve the state's historic resources. The state pledged to add a 25 percent historic rehabilitation tax credit to the 20 percent already offered by the federal government to any developer or property owner who would invest money to improve buildings in historic districts. The result was that developers and property owners could save 45 cents on every dollar invested. Both Harnsberger and Mills had served on Richmond's Commission for Architectural Review, the board that oversees changes and additions to the city's Old and Historic Districts. They knew that historic rehabilitation tax credits could be key for saving some of the city's 2,500 historically significant yet distressed buildings. So when the state offered its tax breaks, the architects sharpened their focus on how to adaptively reuse existing buildings. Soon, they were experts in the intricacies of how to apply for and receive historic designation status and tax incentives for projects in historic urban areas. Their predictions were right. Developers started calling. Since the state's tax-break measure was enacted, it has spurred private investment of more than $316 million in the rehabilitation of more than 264 landmark buildings throughout Virginia. And it's made doing business in the city of Richmond possible  even attractive, some developers say. "You've got to be able to convince a bank that it's feasible," says Robin Miller, a developer who moved to Richmond nine years ago from Tennessee. Miller, who hired Commonwealth Architects to design the Stuart Circle development, has transformed some of the city's most ignored buildings like Linden Tower, Kensington Gardens, the Parsons' House, the former Robert E. Lee Elementary School and now Stuart Circle Hospital from vacant ghosts to upscale apartments, condominiums and townhouses. Miller says he would not have invested his money if it hadn't been for the federal and state tax credits and the abatement program. "Those three tools made the projects I've done work," he says. "It's closed the gap between new projects and restoration." Miller credits Commonwealth Architects with promoting the incentives. "If you look around at the high-profile projects around the city, it is that firm that's doing the work." And that's understandable, he says. "Both Doug and Bob have strong roots in preservation and offer a good perspective on adaptive reuse," he says. "But they really love saving old buildings, and that's the name of the game." It seems to be a game that Harnsburger and Mills are winning. Their firm has expanded from three to 30 people in just four years. Collectively, their projects are worth more than $100 million. In September, the firm received the Marguerite Crumley Preservation Award from the Alliance to Conserve Old Richmond Neighborhoods, a Richmond preservation group. The local praise is a distinction that matters, the firm's partners say. After all, it's their goal to revitalize their city. The Superior Warehouse building rests on a hill that has been a prime and hotly contested development site. Facing Main Street on the cusp of Church Hill, the tobacco warehouse was built in 1853 and remains one of the few contiguous pre-Civil War blocks in Richmond. Last year, the Superior building was almost razed. "It was demolition by neglect," Mills says of the building's eroding condition. The developer, Forest City, wanted to replace the building with a grocery store for nearby Church Hill and Shockoe Bottom residents. Some residents, preservationists and the city's Commission for Architectural Review were appalled. A fight ensued and a compromise emerged. Today, a grocery store is nearly completed on property just west of the Superior building. Flanking it on the east is a new CVS pharmacy. The Superior building, cleaned up and nearly rehabilitated, towers above the two stores. It will soon be home to 28 one- and two-bedroom loft apartments. Mills has been passionate about the project. "I consider this to be the touchstone of great preservation efforts by the city," Mills says. In 1994 when Lt. Gov. Tim Kaine was elected to Richmond City Council for the 2nd District, he paid more attention to things like education and crime, he says, than to historic preservation. "It wasn't on my radar screen," Kaine says. "Bob and Doug, probably more than anyone else, made me a convert and showed me that historic preservation could be a tool to revitalization, particularly in a city like Richmond with neighborhoods like Church Hill, Jackson Ward and so many others like them." While Kaine was mayor he served as president of Richmond Renaissance, a public-private partnership that advocates Richmond culture and business. The group works closely with the city's Commission for Architectural Review. "I think everybody [on Richmond Renaissance] sees the issues of preservation differently because of the work that Bob and Doug have done to promote how it can be used to grow the economy and character of the city," Kaine says. The city's CAR board has reviewed "Old and Historic" sites since 1957 when it first gave the designation to the St. John's Church neighborhood in Church Hill. Since then, the city has bestowed the name at least 41 times, to include 12 additional neighborhoods and 29 individual properties. But the city has little other than the designation and its real-estate tax abatement program to support its historic preservation goals. The city suffers whenever idle buildings remain vacant or when attempts to reuse them aren't successful or compatible with the neighborhood, Harnsberger and Mills maintain. And when people leave and businesses pull out or fail, Richmond's existing stock of historic and architectural resources stands at greater risk of deterioration. In addition to the city's "Old and Historic" designation, there is the Virginia Landmark Register administered by the state Department of Historic Resources and the federally instituted National Register of Historic Places. Richmond has the largest number of listings and structures on the National Register of any community in Virginia. Meantime, 2,500 historically or architecturally important urban buildings  some, probably fine examples of 19th- and 20th-century federal, Greek-revival, Italiante, Queen Anne and Colonial-revival structures  go ignored. The historic restoration of Second Presbyterian Church, the rare Gothic-revival landmark, has taken nearly a year. It will cost $2.3 million to complete. When the church was built in 1845, it was the only project south of the Mason-Dixon Line for renowned architect Minard Lafever of Brooklyn. Its original materials, brownstone and cast iron, were delivered by rail from upstate New York. But the brownstone was not rightly quarried, dressed or installed in the parapet and bell tower, and after 156 years, erosion threatened its collapse. Confederate Gen. Thomas "Stonewall" Jackson worshiped in its sanctuary. Harnsberger worships in the same place today. He considers this as he works on another plan. It's a contextual landscape design that will accompany an important statue project coming soon to Richmond that could offer a new perspective on history. "Where Commonwealth Architects has been really smart is in recognizing that the greatest resource we have is our history," says Jennie Knapp, executive director for A.C.O.R.N., a group whose mission is to save ailing historic houses. "They seem to get it," she says, "Why not think of a way to recapture interest by highlighting the one thing we can't build someplace else?" It's what Mills and Harnsberger say they are committed to doing. And, they say, the time is right. "The urban environment is in place," Mills says, "the structures are in place, and we're suggesting that there needs to be a stronger emphasis on coming back to the city and revitalizing the existing structures, and then infilling where we've lost buildings over time." Economically, he says, "what we're trying to suggest with the inclusion of tax incentives and tax credits, is that revitalization is in fact a less expensive solution." "The economics make sense," Harnsberger says. "And the quality of life makes even more sense." "The quality of life of the community," Mills adds. "And that's one of the things that we've lost by our sprawl is our sense of community."